Earthquakes are difficult to predict. With our understanding of plate tectonics and knowledge of past history, we can accurately predict where earthquakes are likely to happen. Predicting exactly when is much more difficult. "Sometime within the next 50 years" is adequate for devising building codes, but not for evacuating a major city. While many researchers are delving into geological aspects of earthquake prediction, many others study earthquakes using fractals and chaos theory mathematical techniques which apparently outlaw the possibility of good predictions. Earthquakes occur mainly along the boundaries of tectonic plates (although some occur in mid-plate), places where pieces of the earth collide with other pieces. Some of these collisions force one plate under another (subduction zones such as deep sea trenches), some slide sideways past each other (transform faults such as the San Andreas), and some just smash into each other and pile up huge mountains (the Himalayas). Places where the earth tears apart (rift valleys and mid-oceanic ridges) are also prone to earthquakes. An earthquake in a populated area can kill hundreds of people, make thousands homeless, and cause billions of dollars of property damage. Even an earthquake in a completely unpopulated underwater area can cause immensely destructive tsunamis. Many of the major population centers of the world lie directly on major tectonic faults (Los Angeles, Mexico City, and Tokyo for example) and any port city could be drowned by a tsunami so researchers all over the world are working on predicting earthquakes and mitigating their effects. Earthquake prevention does not seem possible. Perhaps the main problem with earthquake prediction is that the faults display fractal geometry and the final buildup and release of stress "are fast and strongly non-linear" processes. (Meissner 161) Even "the most universal formula in seismology," (Diao et al 205), the Gutenberg-Richter Law relating magnitude, energy, and frequency, is a classic fractal of dimension 1.8 to 2. (Turcotte 7) Of course, fractals weren't quantified and explained by Mandelbrot until 30 years after Gutenberg and Richter codified their law in 1954. "A fractal is, by definition, an object of Hausdorff-Besicovitch dimension strictly exceeding its topological dimension." (Herzfeld 218) Perhaps one of the most vexing things about fractals is they have a fractional dimension. This bothers most people who were raised on standard Euclidean geometry of one-dimensional lines and two-dimensional planes. An easy way to think of a fractional dimension is to picture a line on a sheet of paper. The sheet of paper represents two-dimensional space. Any normal line drawn on it would be one-dimensional. But now consider someone like my three-year-old daughter Karen getting very excited and scribbling a line all over the paper. If the line completely covered the paper, then you could say it turned into a two-dimensional line and sometime during the scribbling it was a one-and-a-half dimensional line. Sufficiently complex lines can have dimensions greater than one. A more rigorous and classic development of fractals uses an example from marine geology coastlines. Mandelbrot's book even has a chapter titled "How Long Is the Coast of Britain?" (25) The main problem with measuring a coastline is that no matter what base unit of measure you use, you can always use a smaller one to get a longer length. Mapping the east coast of America using a scale of 100 miles per inch (since we're in America) will display some of the larger bays and peninsulas such as Chesapeake Bay and Cape Cod but will ignore smaller ones. Dropping down an order of magnitude and drawing a map at a scale of ten miles per inch will meander around many of the smaller bays and protrusions missed in the larger mapping. This would make the total length of the coast quite a bit longer. Dropping another order of magnitude to one mile per inch, then to one-tenth mile and so on will keep locating smaller and smaller bays, coves, and inlets, each of which increase the total length of the coastline. This keeps happening down to tiny scales such as measuring the water where it winds in and out around individual rocks, pebbles and grains of sand. To better study these types of curves, Mandelbrot began creating and studying other mathematical "curves." These usually consist of a basic section or polygon and then a "generator" which replaces each section of the curve. The classic Koch Island begins with a triangle and replaces each side with a new side that is 4/3 the length of the original side. 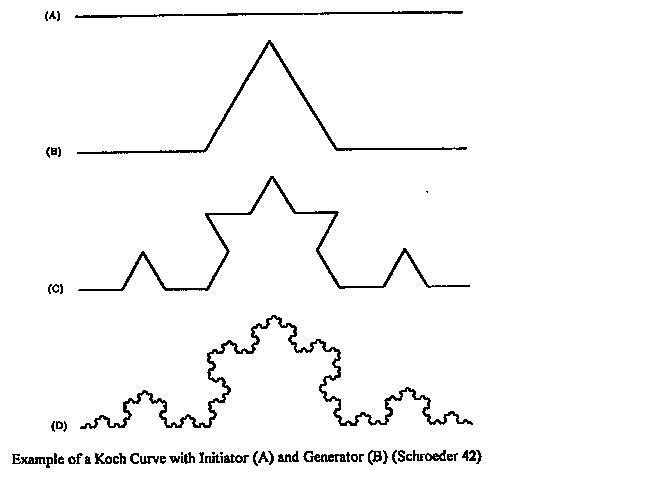 The development of the Koch curve displays self-similarity, another important aspect of fractals. Mathematicians even call self-similarity another dimension with another method of measurement. They use it to determine how similar a piece of a curve is to another piece of the curve. For example, any piece of a straight line is identical to any other piece or the entire straight line and any piece of a Koch curve is very similar to any other piece under any scale (another concept that goes along with self-similarity). studies of fractures, especially non-linear processes. Chaos, the study of non-predictable, non-linear processes, is also being studied in earthquakes. Some researchers truthfully say that chaos does not equal fractal (Herzfeld 219), but that is a shortsighted view of a mathematical technique. While Mandelbrot doesn't provide a lot of hard, fast examples in his "essay," he nevertheless provides examples and makes "pleas for a more geometric approach to turbulence and for the use of fractals." (10) (Turbulence is the classic non-linear problem in mathematical physics). There are many instances of mathematical tools developed in one area turning out to be useful in other areas. For example, the study of unending series (Number Theory) was found to be useful in determining integrals of hyperbolic functions (Calculus) which were used to derive my favorite equation based on transcendental (Algebra) functions: eãi = -1 . So, while Ute Herzfeld brings up a few good points about the misuse of fractals, confusing chaos and fractals is not one of them. Fractal curves can be constructed to model chaotic processes. These curves allow discovery of the dimension of the process. In addition, with a curve associated with a "weakly chaotic system, a limited prediction might be possible" (Meissner 159) in exactly the same way an algebraic curve of a normal calculus function is used for prediction. But a fractal curve cannot be used for exact prediction due to its inherently chaotic, non-differentiable nature (which implies fractals are perfectly suited for the study of chaos). Where We Stand Now On Predicting Earthquakes. Although chaotic, non-linear models and fractal curves technically prevent precise predictions, they are useful for a more general sort of prediction. Yet we need to do much more studying, measuring, and monitoring to get more accurate equations and useful models. For example, on some faults the fractal dimension of small quakes reduces just before a major quake; on others the dimension rises; on others it fluctuates. "Thus it is difficult to forecast earthquakes using the fractal dimension." (Diao et al 201) This is just one of many problems associated with earthquake prediction.